Though perfuming ourselves and our surroundings isn’t anything new, the use of fragrance is constantly evolving, including the technology to dispense it. One of the first attempts to bring the world of tech and fragrances together in the 20th century came in the form of Smell-O-Vision and AromaRama, a technology that dispensed fragrance over a film. Though the technology received negative reviews and didn’t catch on, the idea persisted. Scenting a space through various applications like incense, candles and sprays, has offered the industry an opportunity to flex its creativity in developing unique fragrance combinations and adding a new dimension to a room. As we look at the latest trends and innovations, it is also important to examine where and what air care products are being used. Taking a room-by-room approach shows a deeper understanding of consumers, and more specifically what fragrance they want for certain situations. One of the largest segments of the home care fragrance market is traditional sprays and aerosol air fresheners. Though the technology has been used for years, scenting living and family rooms, unique and different fragrance combinations are appearing in these products. One of the biggest home care fragrance trends is seasonal scents. Febreze’s AIR line contains products with pumpkin, pine and cranberry scents. Air Wick’s Freshmatic Ultra Automatic Spray offers seasonal-favorite scents like warm apple and sugar cookies, along with similar pine and pumpkin spice products. Glade also includes a series of seasonal air freshener sprays, which include Tree Lighting Wonder, Cozy Cider Sipping, Frosting With Love and Candy Sprinkling Joy. Seasonal scents aren’t the only trending home care fragrances. Fragrances that elicit a specific moment or place are becoming more popular. Air Wick’s Life Scents fragrance are a prime example, including fragrances such as Paradise Retreat, Summer Delights and Mom’s Baking. In addition to having several holiday fragrances, Yankee Candle also offers home care sprays in Beach Walk, Mediterranean Breeze, Midsummer Night and Autumn in the Park scents. One of the biggest wellness applications for home care fragrances comes in terms of sleep technology. A 2014 study from Mintel showed that roughly 60% of consumers are willing to try fragrance products to improve their sleep experience.c This has resulted in a variety of sleep product launches, from small plug-ins to linen spray and beauty products for the bedroom. “Like other markets, the health & wellness trend has been influencing the home fragrance market. From natural ingredients to eco-friendly packaging, consumers are looking for “cleaner” home care,” said McGee. Plug-in devices are one popular device that provides a cheap and effective way to promote better sleep. Products like ZzzQuil and Febreze’s Sleep Serenity Bedroom Diffuser Moonlit Lavender dispenses a fragrance throughout the room. 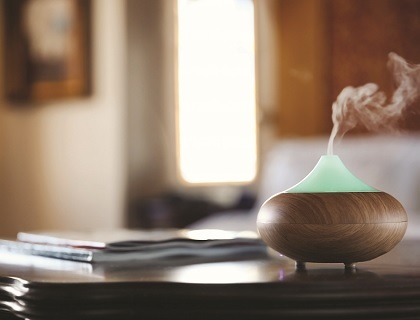 For aromatherapy fans, diffusers and essential oil devices promote a most restful night of sleep. This Work’s Scent Well Diffuser & Deep Sleep Oil is a portable USB-chargeable device with a special sleep blend fragrance. A quick Amazon search for “aromatherapy sleep” produces over 10,000 results of devices and aromatherapy blends, a strong indicator of consumers’ growing interest in essential oil products. Lotions and skin care products and sprays are also becoming more prevalent in the sleep and wellness sector. Bath & Body Works offers a range of pillow mist sprays, with scents such as lavender and cedarwood, vanilla and patchouli, eucalyptus and spearmint and eucalyptus and tea. Additionally, perfume brands are emerging into the sleep and linen spray market. Jo Malone offers Lino nel Vento Linen Spray, a lavender spray for better sleep, and fragrance brand Kai offers Kai Room and Linen Spray, a floral scent spray. In the realm of skin care products and lotions, fragranced products are popping up more and more. Neom offers its Scent to Sleep range, which includes scented body and hand washes, hand balms and body and hair oil. Organic body product company Badger offers a line of scented sleep products that include Sleep Balm, a product with balsam fir, bergamot and rosemary; and Night-Night Balm, a product designed for children with chamomile, sandalwood and lavender scents. K-beauty is even getting in on the sleep game with Rest Up’s Lavender Patch, a scented foot patch that can be used to soothe you to sleep. Not only are fragrances being used to put you to sleep, they are also being used to wake you up. In 2017, Givaudan partnered with French inventor Guillaume Rolland to create an olfactory alarm clock.d Givaudan perfumers helped create seven of the morning fragrances for the device, which include hot croissant, buttered toast, fresh coffee, seaside, chocolate, cut grass and mint. In the spirit of Smell-O-Vision, home care fragrances have begun to embrace the tech world with digital devices and smart technologies. One of the leading companies in the smart fragrance device market is Moodo, the creator of the Keurig-like scent device. The device works by inserting four fragrance capsules into the device and controlling the intensity and potency of each via a smartphone app. Users can either order their own blend of capsules or order from a family of fragrances. "It isn’t simply about an enjoyable scent – it is about the interaction between a place of comfort and our sense of smell." Similarly, Aera and its Smart 2.0 Diffuser offer a customizable scent experience for consumers. The device allows users to control the device from a separate phone app. Additionally, users can customize the device’s settings based on the size of the room. In a slight variation to the traditional diffuser, a series of aromatherapy diffusers with music capabilities are growing in popularity. ArtNaturals, Pryzma, and InnoGear are just a few examples of companies that offer diffusers with hands-free Bluetooth capabilities. Maybe one day, technology will even find a way to include scent into our entertainment systems – effectively reviving the ill-fated Smell-O-Vision for a more tech-savvy, fragrance-appreciating generation. With these changes in fragrances and the way they are utilized in the home care fragrance industry, the market should see healthy growth, along with interesting innovation. These innovations though aren’t exclusive to the home. For automobile drivers, there is a range of plug-in air fresheners and car vent clips in a variety of scents and styles. For travelers, they might be greeted at the airport with a scent, dispensed by HVAC-connected technologies. And then when they arrive at the hotel, they might notice a particular scent in the lobby of the hotel, as they are getting ready to check-in. Not only do these scents offer enjoyment for the consumer, but it establishes another branding initiative for companies. Despite these other areas of environmental scenting, the home care fragrance market occupies a more intimate space for consumers. It isn’t simply about an enjoyable scent – it is about the interaction between a place of comfort and our sense of smell. As the market continues to evolve and change, two things remain the same, the place and the feeling that one is home. c Urbanowicz, N., (February, 2014).Mintel Finds Consumers Using Fragrance to Enhance Beauty Rest. Perfumer & Flavorist. Retrieved December, 2017 from http://www. perfumer­flavorist. com/ fragrance/ trends/ Mintel-Finds-Consumers-Using-Fragrance-to-Enhance-Beauty-Rest 245850451. html. d Schleehauf, B., (May, 2017).Gi­vaudan Puts You to Sleep With DreamScentz. Perfumer & Flavorist. Retrieved December, 2017 from http://www. perfumer­flavorist. com/ fragrance/ research/ Givaudan-Puts-You-to-Sleep-With-DreamScentz--441313863. html. e (November, 2017). Moodo, the Smartest Home Fragrance Diffuser, Now Available for General Purchase Just in Time for the Holidays. Digital Journal. Retrieved December, 2017 from http://www. digitalj­ournal. com/ pr/ 3564643.
f (June, 2017). Essential Oils Market by Product Type (Orange, Lemon, Lime, Peppermint, Citronella, Jasmine), Method of Extraction, Application (Food & Beverage, Cosmetics & Toiletries, Aromatherapy, Home Care, Health Care), and Region - Global Forecast to 2022. Markets and Markets Research. Retrieved December, 2017 from http://www. digitalj­ournal. com/ pr/ 3564643.
g (August, 2017). Aromatherapy Diffusers Market Size Worth $2.68 Billion By 2025. Grand View Research, Inc. Retrieved December, 2017 from https://www. grandvie­wresearch. com/ press-release/ global-aromatherapy-diffusers-market.